“No Country For Old Muppets” is a new pop culture illustration by California-based artist Dan LuVisi that mixes up characters from The Muppets with the 2007 film, No Country For Old Men. 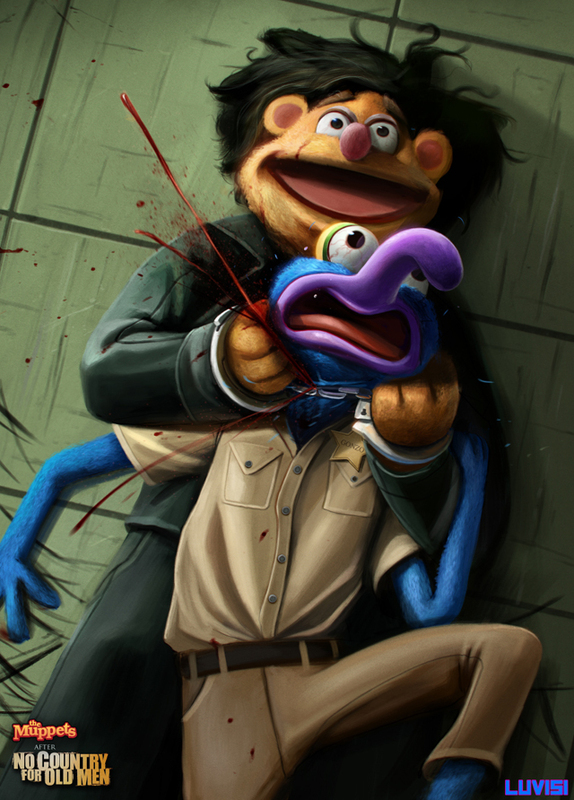 Dan’s gruesome illustration depicts Fozzie Bear as the hitman Anton Chigurh (Javier Bardem), who is in the middle of strangling deputy Gonzo with handcuffs. After the success of their first parody, Drive, the Muppet gang decided to dive into another. Tired of performing the same routine comedy roles, Fozzie Bear wanted to try something new. He suggested portraying the role that was brilliantly captured by Javier Bardem, as infamous hitman Anton Chigurh in the Coen Brother’s crime-drama, No County For Old Men. Gonzo was not pleased that he would have to die, again.